Hey, more for the BBC, one on today, another on Saturday! Listen during the Saturday Play “Listen Again” program. Also upcoming is a show one listener describes as: “Not particularly memorable from its first outing.” It’s a comedy series, set in 2012 – the second season, made up of four parts, starts Thursday night. The antics of an incompetent Royal Navy crew of the nuclear stealth submarine HMS Goliath. 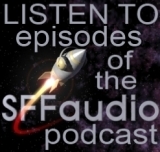 This episode: Disaster is threatened in the form of a new crew member, a noxious gas and a bad haircut. Thanks go to Roy for this info! BBC7’s The Seventh Dimension has a Brian Aldiss short story! Douglas Adams’ Dirk Gently as a FAN audio drama!